If you are a Girl Scout you know who JGLow is. 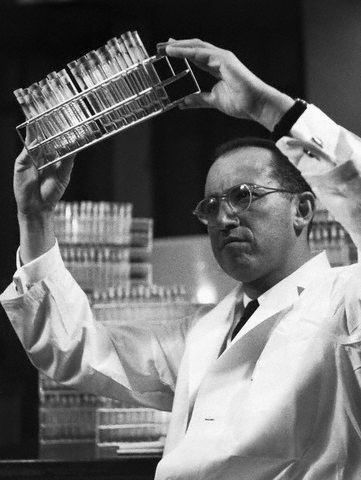 This is one of those bioBlogs that I knew I was going to do weeks before the date. It is my honor to celebrate her birthday. 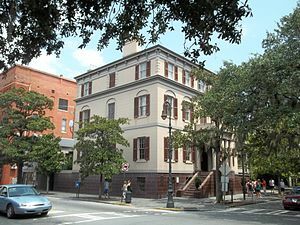 Juliette Magill Kinzie Gordon was born on this day in Savannah Georgia in 1860. Today is the 152nd anniversary of her birth. “Daisy” was a beautiful baby with a sweet disposition. She was the second of the Gordon’s six children. The family lived at 10 East Oglethorpe Avenue in a double town house in a wealthy section of town. She had all the advantages of a well to do Southern girl. But she was born on the cusp of the Civil War. Daisy was born in October 1860 and hostilities at Fort Sumter, South Carolina marked the official beginning of the war on April 12th 1861. The Gordon’s was a house divided. Her father was pro-succession and a slave holder, her mother was from the Chicago and an abolitionist. Her father joined the Confederate Army and was away from home for most Daisy’s early life. She didn’t see him for more than a few days at a time. Food shortages in the city meant that even the wealthy Gordons suffered from malnutrition. 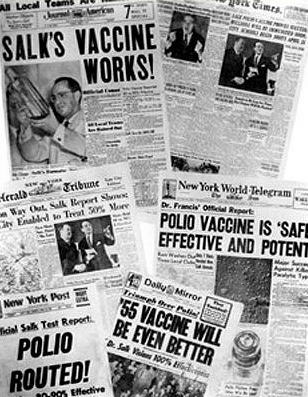 Savannah’s coastal location meant illnesses like malaria were always a threat. By 1864 things were looking grim for the Confederacy. General Sherman had taken Atlanta and was marching through Georgia to the sea burning a path in his wake. 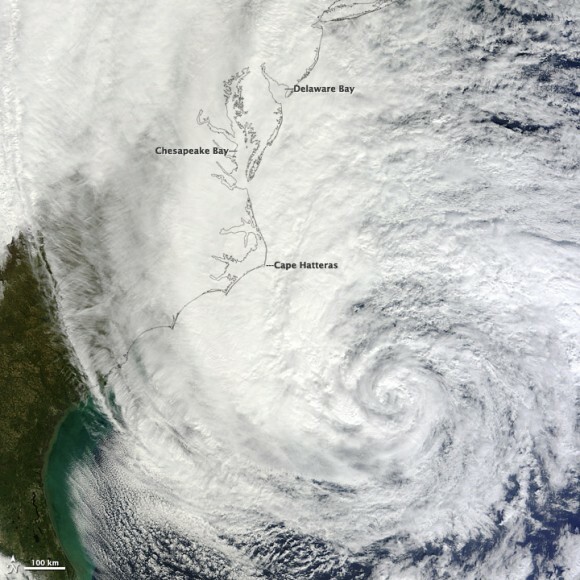 Savannah was the last city in his way. When the city surrendered Eleanor Kinzie Gordon invited the General, an old friend, to tea. He brought her letters and packages from her friends and family in Chicago. When she was a teen Daisy went to the Virginia Female Institute (now Stuart Hall School) in Staunton, Virginia. Then she went to Mesdemoiselles Charbonniers for finishing school in New York City. As a young woman she traveled in the US and Europe. She spent time in New York trying to make a living painting. She met and married a wealthy English cotton merchant, William Mackay Low on December 21, 1886. When well-wishers threw the traditional rice at the newlyweds a grain became lodged in Daisy’s ear. The pain became so bad that she went to a doctor to have the rice removed. 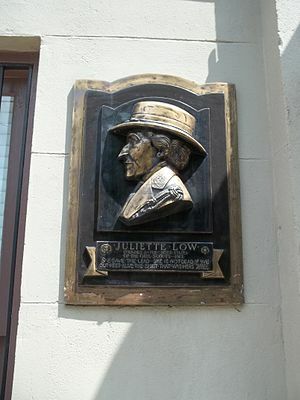 “When trying to remove the rice, the doctor punctured the eardrum and damaged the nerve-endings resulting in a total loss of hearing in that ear.” [Juliette Gordon Low Birthplace] It was an omen of things to come. The Lows lived in England and traveled extensively. They spent their summers in England and their winters in the US. The couple, who had been unable to conceive children had begun to drift apart. One of William Low‘s new hobbies was his mistress, Ms. Anna Bateman. By 1901 he had asked Daisy repeatedly for a divorce, but she refused. At that time a divorce brought shame on all parties involved. But when Daisy returned home from a trip to find Ms. Bateman living in the house and her (Daisy’s) things moved to the servants quarters she gave in. Daisy went to stay with friends and the Lows were legally seperated. Before their final divorce papers could come through William Low died. He left everything to Bateman, Daisy had to go through the embaressment of contesting the will. 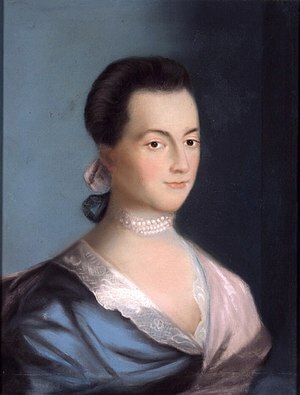 She eventually got the Savannah Lafayette Ward estate. Daisy began to look for new purpose in her life. She traveled, this time as far as Egypt and India. In 1911 she met Sir Robert Baden-Powell, the founder of the Boy Scouts. 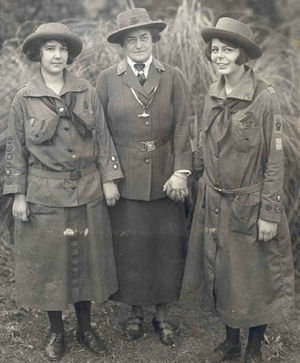 She worked with Baden-Powell, his wife Olive, and his sister Agnes in their efforts to create girl’s version of the scouts. Low used her own money (with contributions from her friends and family) and her considerable energy to forge the new organization. The name of the group was changed to Girl Scouts a year later. It was her goal to bring girls from all backgrounds together as equals to enjoy the outdoors, to learn new skills and to be ambassadors of peace in the world. In 1923 Daisy was diagnosed with breast cancer. She died four years late on January 17, 1927. She was laid to rest at the Laurel Grove Cemetery in Savannah, Georgia. A Scout to the end, Daisy is burried her Girl Scout uniform. 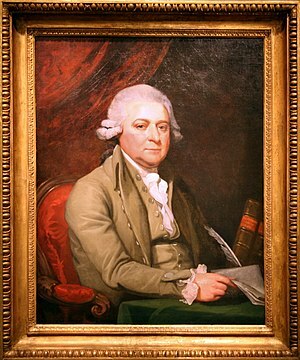 John Adams was born on this day in Braintree, Massachusetts Bay Colony, USA in 1735. Today is the 275th anniversary of his birth. His ancestors came over on the Mayflower. His father was a farmer, shoemaker, a Puritan deacon, a lieutenant in the militia and a member of town council. John loved being outdoors and he sometimes skipped school to hunt or fish. After graduation he taught school for a time to earn enough money to study law. 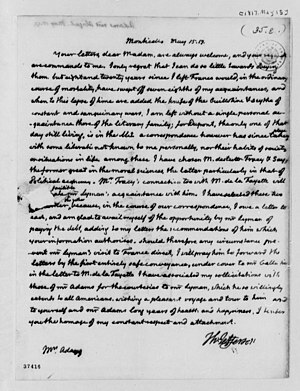 In 1756 he began a two-year apprenticeship studying law with John Putnam and was admitted to the bar at 26. He opened his practice in 1758, but things were slow going at first. He had only one case in his first year of practicing law which he lost. His Law practice began to grow and he felt he was on sturdy enough financial ground to begin courting Abigail Smith. They married in 1764. 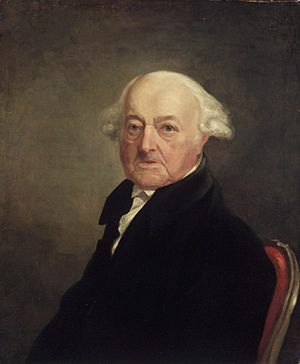 John and Abigail Adams had six children together (including John Quincy Adams [click HERE for my John Quincy bioBlog ] and one of American History’s most endearing relationships. When the Incident on King Street (aka the Boston Massacre) resulted in the death of five civilians in March of 1770 Adams defended the eight British soldiers and Captain Preston, the lone officer, charged with the crime. It was important that the soldiers receive a fair trail so the Crown would not have grounds for retaliation. 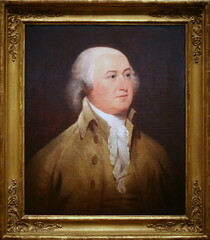 Adams, with his Patriot pedigree and commitment to the letter of the law, was the perfect man for the job. His impassioned speech that “Facts are stubborn things; and whatever may be our wishes, our inclinations, or the dictates of our passion, they cannot alter the state of facts and evidence.”[Quotes.net] saved the men’s lives. (Sam Adams was on the prosecuting team). While his flashier (and more popular) cousin Samuel Adams rallied/roused crowds in the square, John worked in the courts, taking a more measured approach to American equality. In June of 1776 the Continental Congress appointed Adams, Thomas Jefferson, Benjamin Franklin, Roger Sherman and Robert Livingston to the Committee of Five to draft a Declaration of Independence. “A Declaration by the Representatives of the United States of America, in General Congress assembled” was presented on June 28th. After much debate (especially about the slavery issue) the Declaration was adopted late in the morning of July 4th 1776. 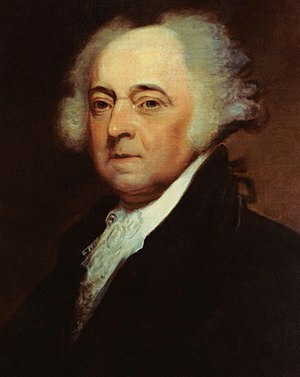 Adams wrote a pamphlet detailing his Thoughts on Government. In it he advised that the new Continental government be one which benefited the happiness and virtue of the greatest number of people (not one that benefited the knighted few or the King). He advocated a government with separate executive, judicial and legislative branches. 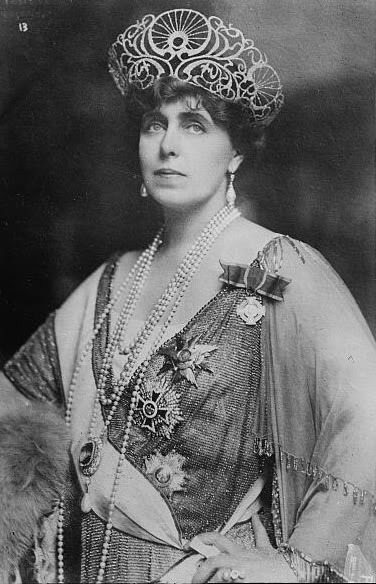 Marie Alexandra Victoria, Princess Marie of Edinburgh, was born on this day at Eastwell Park in Kent, England in 1875. Today is the 137th anniversary of her birth. She was the eldest daughter of Prince Alfred of England and Grand Duchess Maria Alexandrovna of Russia and the granddaughter of Queen Victoria on her father’s side and of Tsar Alexander II on her mother’s side. Because of her double royal lineage she was considered highly suitable for a Royal match of her own. When Marie was 17 she was married to Prince Ferdinand of Romania, a German raised nephew of King Carol I of Romania in Sigmaringen German in 1893. Ferdinand was 27 at the time. They had 6 children. Three boys and three girls. However, the marriage was not a happy one and The Princess took a lover, Barbu Stirbey. It is likely that Mircea (and possibly Mignon and Ileana) were Stirbey’s. In 1914 King Carol I died and Ferdinand took the throne. Marie became Her Majesty the Queen of Romania but the couple were delayed in becoming the King and Queen until after World War 1. During the War Princess Marie influenced the country to side with the Allies (and away from the Germans), she volunteered with the Red Cross and nursed the sick and wounded. Her book My Country raised money for the Red Cross. 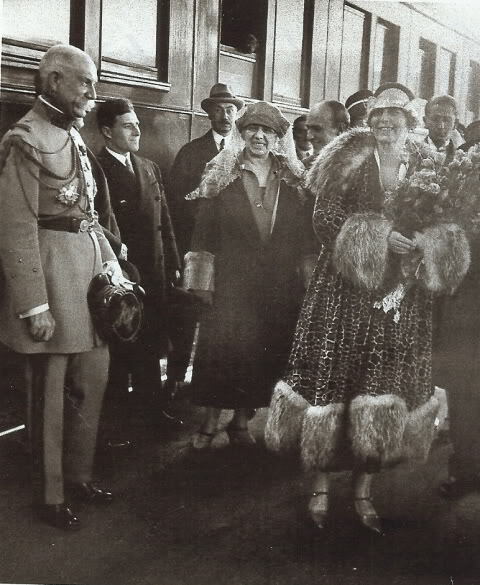 Ferdinand and Marie were finally crowned in 1922. She was determined to be a modern queen. Queen Marie was very popular and travelled through out Europe and the US. 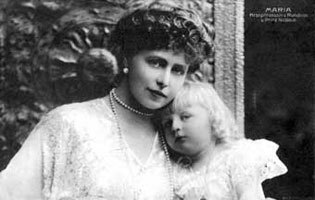 Although she was close with her younger children she was never on good terms with Crown Prince Carol (who became King Carol II after Ferdinand’s death in 1927). After Carol’s coronation he excluded his mother. She remained the Romania and wrote her two-part memoir, The Story of My Life. She died after a sudden illness in 1938. Following the Queen’s instructions her heart was removed from her body and kept at a cloister at Balchik Palace. The rest of her remains were interred with her husband. Desiderius Erasmus was born on this day in Rotterdam, Holland in 1467 (or perhaps 1466). Today is the 545th (546th) anniversary of his birth. He was the illegitimate son of Gerard (aka Roger) of Gouda and his housekeeper, Margaret Rogers. He was their second son. Gerard either was a Catholic priest at the time of Erasmus’ birth or he took vows soon after. Although his parents never married the boys weren’t neglected. Their father saw to it that they were well educated. He sent 9-year-old Erasmus and 12-year-old Pieter to “one of the best Latin grammar schools in the Netherlands near Deventer.” [Stanford Encyclopedia of Philosophy] Margaret moved to the town to take care of the boys. At this semi-monastic school they and learned Latin, Greek and a humanist approach to literature and culture. In 1483 the Black Plague hit the city. Margaret died and the boys went back to Gouda. 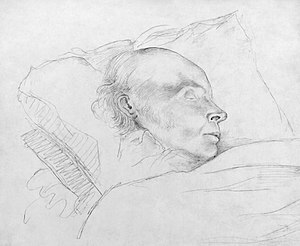 Gerard soon fell ill too. At his death the brothers were left with a small inheritance in the hands of three guardians. At first they were sent to a grammar school. “The highest level of study there did not go up to the level the brothers had already completed at Deventer. Erasmus regarded this period as a total waste.” [Ibid] The boy’s options were limited. It was an option neither of them wanted, but Pieter agreed, and after much pressure Erasmus finally gave in. He entered the Steyn monastery in 1487 as a novice. Here he found kindred spirits who shared his love of classical literature. He wrote De Contemptu mundi (On Contempt of the World) while at Steyn (although it wasn’t published until 1521). Still he resented the limits on his activities and freedoms, and he felt thwarted by the limited intellect of some of the other monks (he wrote about that in Antibarbarorum liber (Book Against the Barbarians). None the less he agreed to be ordained as a priest in 1492. Ordination should have turned the lock in the monastery, gate as it were, but Erasmus’ was already “identified as an intelligent and widely read monk with an outstanding Latin style.” [Stanford Encyclopedia of Philosophy] and about a year after taking final vows he was plucked from the monastery to act as secretary to the Bishop of Cambrai, Henry of Bergen. It was to be a temporary assignment, but some how he managed never to return. For the next two decades he travelled back and forth across Europe staying in Paris, Leuven (Belgium), England, Basel (Switzerland) and Italy but he consciously avoided any permanent alliances that would limit his intellectual freedom or literary expression. “…after his return from England in 1500, religion as well as the study of Greek became more prominent in his thought.”[Ibid] He was determined to master Greek so he could translate biblical texts and he focused a good deal of his attention on the writings of “St. Jerome, the most learned of the ancient Latin Fathers… ” [Ibid] He received the degree of Doctor of Divinity at Turin. He befriended printer/publisher Aldus Manutius and embraced the new technology of the printing press as a way to communicate. It didn’t hurt that he dedicated his Greek/Latin hybrid New Testament to Pope Leo X. in 1517 He published his research on St. Jerome (all seven volumes of it) ” confirming his status as the greatest scholar of his generation.” [Ibid] Erasmus and Froben also put out a new addition of the former’s Adages with additional proverbs. Leo approved the petition. 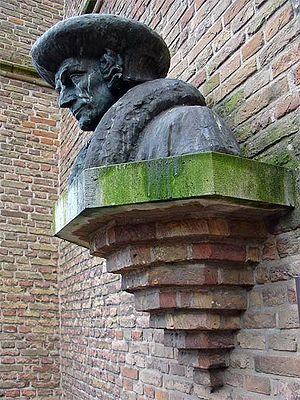 Erasmus moved to the University of Louvain in the Netherlands.Although his German Humanism was not a perfect match with the more conservative Louvian theology Erasmus seemed to have found a home. But then there was that GERMAN, Martin Luther, who went and nailed his protest to the door of a church. “With remarkable rapidity, reform-minded young German humanists (and many older ones also) who had become admirers of Erasmus identified Luther’s ideas and reform program with those of Erasmus, regarding Luther and Erasmus as leaders of a single movement.” [Ibid] Erasmus HAD been a vocal critic regarding the follies and abuses of the clergy, but it was against his nature to take up a partisan position on the issue of Protestantism. Natalie Anne Merchant was born on this day in Jamestown, New York, USA in 1963. She is 49 years old. Merchant is the third of four children. Although her parents never allowed their children to watch television there was always plenty of music in the house. Her mother listened to an eclectic mix of classical music, show tunes, jazz and pop music and it rubbed off on little Natalie. Merchant dropped out of high school at 16 and worked briefly at a health food store. After a stint working at a summer program for handicapped children she considered going back to school become a special education teacher. 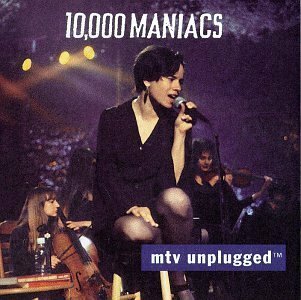 10,000 Maniacs reached its peak of popularity around 1988. They weren’t “chart driven” and never topped Billboard’s Top 100, but they had a loyal fan base, due in large part to their videos on MTV. Merchant left the group shortly after the MTV Unplugged session in 1993 and began work writing and producing her first solo effort Tigerlily. The album came out in 1995 to wide acclaim. 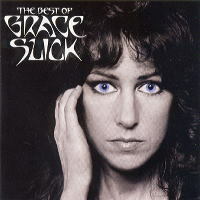 It sold over 5 million copies and earned her a spot in the top-ten lists with Carnival. In 2004 Campfire Songs, a compilation album of “popular, obscure, and unknown” 10,000 Maniac songs, was released. Merchant put out her own Retrospectivealbum the next year. Leave Your Sleep came out in 2010. This concept album includes songs adapted from poetry about childhood. In June of this year Leave Your Sleep became a 48 page picture book with illustrations by Barbara McClintock. The book includes a CD with 19 songs. Merchant continues to write and perform. She will be at the Milwaukee Theatre tomorrow night. If you’re lucky enough to snag tickets… be sure to wish her a happy birthday. Click HERE to see other upcoming Natalie Merchant Shows.